BioZen: Amazing technology and simple to apply. Children, the elderly and anyone with a lowered immune system are most at risk from the health effects. In 2015, Dr. Claude Bärtels (Science4Life Lab) completed a study titled „The influence of electromagnetic radiation on human tissue with special consideration of the effect of magnetic field gradients“. When using a mobile phone, there is a technical Extreme Low Frequency Electro Magnetic Field (ELF-EMF) surrounding it containing gradients. That means this electromagnetic field is diverging in its strength in different areas. Back in 1992, at the California Institute of Technology. Kirschvink — discovered that those kind of technical electromagnetic field with their gradients irritate the magnetite crystals inside the human brain. This sends signals to the central control unit of the brain (the pineal gland). The production of certain proteins and hormones are affected in a negative way which is called a stress response. With the modified effectiveness of melatonin, the immune system is weakened, DNA is damaged, and the body’s protein balance is affected negatively. There are less repair proteins, more stress proteins, and thus the stress level rises in the body. BIOZEN levels out these gradients without negatively affecting the quality of the radio frequency and simulates a flat, natural magnetic field. As a result, the brain’s magnetite crystals are not irritated anymore. The hormone and protein production returns back to normal, the DNA’s shield is built up again, and the body’s proteins start to repair the damaged DNA which helps the stress level to normalize. With its stored quantum information, BIOZEN brings order to the chaos, or rather it prevents chaos from occurring. This has a positive influence on all mobile device emissions. The legally defined specific absorption rate (SAR) only protects our bodies against the influence of high-(radio-)frequency radiation. BioZen is the only technology in the world that expands this protection to a biological level. This is possible by positively changing the low-frequency electromagnetic fields that are formed — in contrast to the competition, which primarily aims to reduce the SAR levels. Just like the SAR value, the effect of BioZen can currently only be demonstrated under laboratory conditions. By smoothing the magnetic peaks, the usage of new mobile technologies becomes permanently easier for our bodies to tolerate. This has been proven scientifically as well as medically. Our organism uses low frequencies (0–30 Hz) for internal communication. The frequencies that our cell phones emit in this range continuously interfere with this communication. As explained above, active phone calls create a low-frequency electromagnetic field in close vicinity to the cell phone. However, its levels are inconsistent: it contains gaps and peaks, which are called gradients. BioZen disassembles these peaks into smooth progressions that make the electromagnetic fields tolerable for our bodies. Red: The magnetic field gradients irritate our organism, which reacts with stress. Blue: Smoothing the peaks results in the simulation of a natural electromagnetic field and causes no reaction by our organism. You are driving a car and accelerate from 0 to 100 over a longer period of time. This will barely affect you at all. However, if you ride a roller coaster, which accelerates from 0 to 100 within 3 seconds, your body will be under physical stress. One effect of BioZen is that your body is under less stress while using mobile devices. Easy to use, Easy to apply! Apply BioZen direclty on or as close as possible to the battery. Press down firmly on the BioZen chip and surround, smoothing out any bubbles. Remove the top flexible plastic cover. Attach BioZen to the external power supply on top of the battery of your router, modem, tablet, laptop or any other electrical device. Attach BioZen to the base station of your power adapter. Attach it to the mobile part the same way you would attach it to your cell phone. Electrosmog (or eSmog) is an informal term for an excessively high concentration of electromagnetic fields with possible adverse effects on the health of living organisms — humans, animals, plants and other animate beings, including single cells. Mobile devices (cell phones, smartphones, notebooks, tablets etc.) produce eSmog and put stress on our internal biological processes. Why are the legal limits for mobile radiation insufficient? The legally defined specific absorption rate (SAR) only protects our bodies against the influence of high-frequency radiation. But our organism actually uses low frequencies for internal communication. The frequencies that our cell phones emit in this range interfere with this communication — continuously. Conclusion: it is proven that the actual damage caused during the use of mobile devices takes place in this area. BioZen is the only technology in the world that expands its protection to include low-frequency radiation and thereby makes it easier for our bodies to tolerate in the long-term. Why is BioZen recommended especially for children and adolescents? The use of BioZen is generally recommended for everyone regardless of their ages. However, the brains of children and adolescents have not finished growing yet and it can be assumed that the negative effects associated with mobile radiation also have a negative impact on the human brain in the long term. 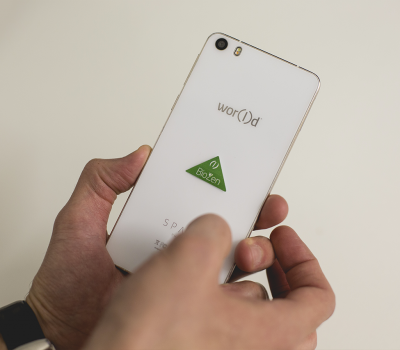 What distinguishes BioZen from other ¨health chips¨for cell phones currently on the market? Our competitors primarily aim to reduce the legally defined SAR levels. However, these SAR levels only protect our bodies against the influence of high-frequency radiation. The BioZen technology is unique in expanding this protection to a biological level. This is possible by positively changing the low-frequency electromagnetic fields that are being formed. These low-frequency waves are the ones that can cause physical harm with the long-term use of mobile devices. In addition, all of the effects of BioZen are reproducible and clearly verified by expert reports — unlike those of the competition. What kinds of negative effects can mobile devices have on an organism? Some examples of known negative effects on the human organism are: heachache/migraine, insomnia, nervousness, depression, dry/burning eyes, weakening of the immune system, skin irritations, etc. 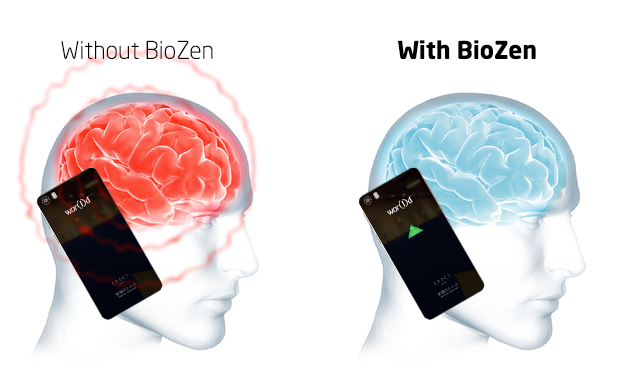 How does BioZen work with phone calls, for example? Phone calls create a low-frequency electromagnetic field in the close vicinity of the cell phone. However, its levels are inconsistent: it contains gaps and peaks, the so-called gradients. Abrupt changes in the electromagnetic field irritate our bodies. Smooth progressions, on the other hand, are harmonious and easy for our bio-organism to tolerate. BioZen breaks these peaks down into smooth progressions that make the electromagnetic fields tolerable for our bodies. What do thermal and athermal effects refer to? Thermal effects need power to operate. The more intensive the mobile radiation is, the more the tissue heats up — for example your ear during phone calls. This is the only type of exposure that is regulated by the legal limits (specific absorption rate, or SAR). Athermal effects don’t need any power, but they have a direct impact on our organism. This happens in the low-frequency area, in which the human organism communicates with itself internally on a continuous basis. These limits are up to 10,000 times lower than is the case with the thermal effects. Regardless of the signal strength, our internal processes are constantly influenced. The principle of resonance applies. What is inside the BioZen chip? BioZen has several layers. The two exterior layers are made of plastic. The interior layers have circuits, which — when they are exposed to electromagnetic waves — smooth the emerging magnetic field gradients in the ultra low frequency range (0–30 Hz), making them easy for our body to tolerate. Does BioZen have an expiration date? No, in theory BioZen lasts forever. At the moment we can say with certainty that five-year-old BioZen chips for mobile devices are still fully effective. Has the effect of BioZen been scientifically verified? Yes, by now the positive effect of BioZen has been verified by the results of numerous scientific and medical studies. The latest measurements were even monitored by BUREAU VERITAS and the results were verified and certified. What was the groundbreaking scientific discovery in this context? The EU-financed European REFLEX study and the privately financed VERUM study were published in 2008. These clearly showed that the legally defined limit should depend on the frequency — but it actually does not. Because every frequency has a different effect on our bodies. This means that a reduction of the SAR levels evidently doesn’t always make sense. Another solution had to be found. This was followed by groundbreaking discoveries in the biological area which showed us which way to go: it was clear that the solution had to lie in the low-frequency range. Does BioZen also work if the mobile devices has a protective cover? Yes, BioZen works whether you have a protective cover for your mobile device or not. What matters is that you attach (stick) BioZen directly to the mobile device, as close to the battery or power supply as possible. What happens if BioZen is not attached correctly (as close as possible to the battery or power supply)? Then we cannot guarantee that BioZen works properly. ALWAYS mount BioZen as close as possible to the battery. Can the effect of BioZen be negatively influenced? Yes. 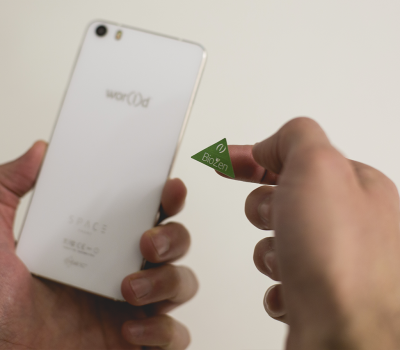 Do not attach any stickers in addition to BioZen. Especially if they consist of any kind of metal (metallic colors). Need Help? Questions? Please let us know. Donec vehicula efficitur sem quis tristiq.